Recently, we discovered an unknown Asarum from Taiwan which is closely related to A. crassisepalum S.F. Huang, T.H. Hsieh and T.C. Huang and A. taipingshanianum S.F. Huang, T.H. Hsieh and T.C. Huang by sharing a thick leaf blade, spreading perianth-lobes and a conical to cylindrical perianth-tube. We compared it with other related species and identified this plant as a new species. This new species differs distinctly from the above two related species by having larger plant body, shortened rhizomes and an inner surface of the perianth-tube that is covered with numerous simple trichomes (vs. glandular trichomes). The pollen tectum in this new species is perforate, which differs from the incomplete reticulate with small supratectate granules in A. crassisepalum and the compact rugulate with small supratectate granules in A. taipingshanianum. Furthermore, these three species are geographically separated from one another. Asarum pubitessellatum C.T. Lu & J.C. Wang, a new species is described and illustrated. The trichomes on the inner surface of the perianth-tube and pollen micromorphology were the valuable characters in the low-level classification of Heterotropa species in Taiwan. Asarum L. (Aristolochiaceae) consists of more than 100 species mainly distributed in the north temperate zone (Cheng and Yang 1983; Kelly 19982001; Huang et al.2003). Most species are distributed in eastern Asia, some species in North America, and one species is endemic to Europe. On the basis of the infrageneric classification proposed by Kelly (1998), this genus was separated into two distinct subgenera, each with two sections. The subgenus Asarum, composed of the sections Asarum and Geotaenium, is characterized by connate styles with terminal stigmas, inferior ovaries, and the inner surface of perianth-tubes puberulent to strigose; while the subgenus Heterotropa, comprising sections Asiasarum and Heterotropa (including Hexastylis), is characterized by six free styles with lateral stigmas, superior or half-inferior ovaries, and the inner surface of perianth-tubes longitudinal or with a strong network of ridges (Cheng and Yang 1983; Sugawara 1987; Kelly 1997). Section Heterotropa is morphologically diversified and composed of ca. 70 species mainly distributed in eastern Asia, particularly in the Sino-Japanese region. However, because the perianth-tube is fleshy and brittle, distortion of the flower in pressed specimens makes its structure difficult to recognize. Consequently, herbarium specimens of Heterotropa are difficult to identify reliably leading to underestimates of the species diversity of the section. In Taiwan, the Flora of Taiwan 2nd ed. recorded only four species in this section; however, our field expeditions in recent years have led to the discovery of 3 new species and 2 new records (Lu and Wang 2009; Lu et al. 2009; Lu et al. 2010). Recently, Ms. Pi-Fong Lu discovered an unknown Asarum in Miaoli, Taiwan. We compared it with other related species and identified this plant as a new species based on the morphological and palynological evidence discussed here. The plants examined in this study were collected from native habitats and then transplanted into the greenhouse of National Taiwan Normal University, Taipei, Taiwan. The morphological and palynological data for A. pubitessellatum were based on the voucher specimens: TAIWAN. Miaoli Hsien: Mt. Chialishan, C. T. Lu 812 (TNU) and same loc., P. F. Lu 19112 (TNU). The palynological data of A. crassisepalum were based on the voucher specimens: TAIWAN. Hsinchu Hsien: Yuanyang Lake, C. T. Lu 624 (TNU). The palynological data of A. taipingshanianum were based on the voucher specimens: TAIWAN. Ilan Hsien: Tsuifeng Lake, C. T. Lu 743 (TNU). Morphological Study—The measurement of floral characters was conducted using a Mitutoyo CD-6″CS digimatic caliper. Pollen morphology—Pollen grains for scanning electron microscopic (SEM) study were collected from fresh anthers and prepared using the method proposed by Erdtman (1952). The acetolyzed grains were dehydrated through an ethanol series, critical point dried, coated with gold, and examined with a Hitachi SM 2400 scanning electron microscope. Descriptive terminology for pollen morphology follows that of Huang et al. (1995). Asarum pubitessellatum C.T. Lu & J.C. Wang, sp. nov.—TYPE: TAIWAN. Miaoli Hsien: Nanchuang Township, Mt. Chialishan, alt. 1,400 m, 12 Dec. 2005, C. T. Lu 812 (holotype: TNU; isotype: TAIF). (Figure 1). Asarum pubitessellatum . A. Habit; B. Front view of flower; C. Perianth-tube; D. Dissected perianth tube, showing stamens and pistil; E. Part of perianth tube, showing tessellated inner surface; F. Stamens; G. Style and stigma; H. Trichomes on the inner surface of perianth tube. (from the holotype, C. T. Lu, 812 (TNU)). Diagnosis: Asarum pubitessellatum C.T. Lu & J.C. Wang is similar to A. crassisepalum S.F. Huang, T.H. Hsieh & T.C. Huang and A. taipingshanianum S.F. Huang, T.H. Hsieh & T.C. Huang but differs from the latter two by having larger plant body (20–30 cm vs. less than 10 cm tall); shortened rhizome; larger perianth-tube (ca. 1.5 cm vs. 1–1.2 cm in diam. ); multicellular simple trichomes (vs. glandular trichomes) on the inner surface of perianth-tube. Perennial herb. Rhizome short. Leaves 2 on each annual branchlet, with petiole 10–23 cm long. Leaf lamina triangular-ovate to sagittate, thick, 8.5–13 × 6–7.5 cm, acute to acuminate at apex, auriculate at base, base of the sinus 3–4.7 cm wide, glabrous adaxially, with white blotches along mid-vein, glabrous and pale green abaxially. Flowering branch with 2–3 cataphylls at its base, ovate, 16–18 mm long, margin ciliate, shed when leaves fully grown. Flowers solitary, facing downward, yellow-greenish to purple-greenish, perianth-tube conical, ca. 13–15 mm long, lower portion 12–13 mm in diam., upper portion 8–10 mm in diam., peduncle 10–18 mm long; outer surface glabrous, pale yellow-greenish and with numerous brownish red spots; internal surface purplish red, tessellated and with ca.12 longitudinal ribs, covered with numerous pubescences along longitudinal and transverse ribs. Tube throat slightly constricted, annual ca. 1–1.5 mm wide, orifice ca. 3–5 mm. Perianth-lobes 3, broadly triangular-ovate, yellow-greenish to purple-greenish, ca. 10–11 × 12–14 mm, spread, without forming semicircular pulvinate areas between the lobes and orifice. Stamens 12 in two whorls, filaments very short, anthers 2.5 mm long, with connective obtuse; ovary superior, 6-locular, styles 6, free, with slightly bifid apices; stigma oblong-ovoid, lateral, inserted in apex notch, extrorse; ovules 8 in each locule. 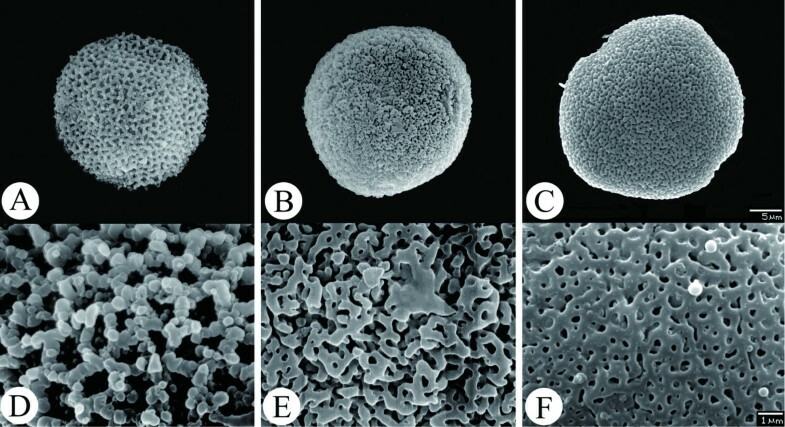 Pollen grains in A. pubitessellatum are oblate spheroidal to suboblate, penta-colporate in equatorial view (Figure 2C), ca. 25.5 × 27 μm–27 × 28.6 μm (P × E). Pollen tectum is perforate without supratectum granules (Figure 2F). Comparison of pollen morphology between A. crassisepalum (A, D), A. taipingshanianum (B, E) and A. pubitessellatum (C, F). A-C. whole pollen. D-F. closed view of pollen tectum. To date, this new species is only known from the type locality in Mt. Chialishan, Miaoli Hsien, Taiwan. It was found under a shaded and moist plantation of the coniferous species Cryptomeria japonica (L.f.) D. Don. The habitat is similar to those of its allies, A. crassisepalum and A. taipingshanianum, which grow in mixed coniferous-broadleaf forests, often among mosses. These three species all occur in cloudy forest zones at middle elevation but in geographically different areas. Asarum crassisepalum inhabits the mountainous area around Yuanyang Lake in Hsuehshan Mountain Range, A. taipingshanianum inhabits the mountainous area of Taipingshan in the Central Mountain Range, and A. pubitessellatum can only be found on Mt. Chialishan on the western side of the Hsuehshan Mountain Range (Figure 3). Geographical distribution of A. crassisepalum (○), A. taipingshanianum (□), and A. pubitessellatum (△). Only two localities with less than 50 plant individuals of A. pubitessellatum have been found. The area of occurrence is estimated to be 10 km2. According to the IUCN red list categories (IUCN 2001) criteria, this species is categorized as critically endangered CR (B2abiii, C2a). We name this species A. pubitessellatum based on the inner surface of its perianth-tube being covered with numerous simple trichomes along ridges. This character is different from other Taiwanese, Chinese, and Japanese Heterotropa species, which have perianth-tubes that are covered with glandular trichomes. 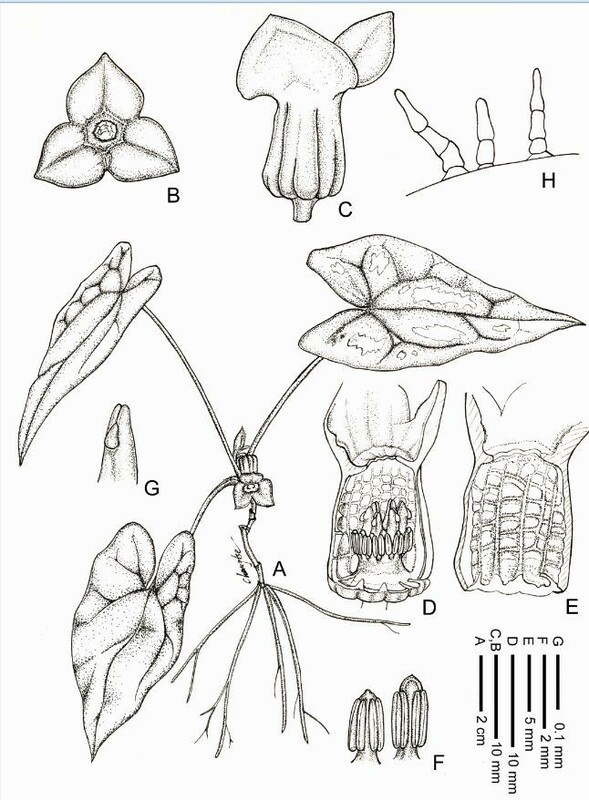 Morphologically, Asarum pubitessellatum appears to resemble A. crassisepalum and A. taipingshanianum. These three species share the following common characters: lustrous, thick leaves, perianth-lobes spreading horizontally, perianth-tube only slightly constricted at the throat, inner surface with tessellated ridges, base of perianth-lobes smooth (lacking tubercles) or scarred by only a few lines (Figure 4). Despite these similarities, A. pubitessellatum is clearly distinguished from A. crassisepalum and A. taipingshanianum by the following characteristics: (1) larger plant body (20–30 cm high vs. usually less than 10 cm) with shorter rhizomes; (2) larger perianth-tube (ca. 1.5 cm vs. 1–1.2 cm) (Figure 4); and (3) multicellular simple trichomes on the inner surface of perianth-tube (vs. sessile unicellular glandular trichomes in A. crassisepalum and unicellular-stalked glandular trichomes in A. taipingshanianum) (Figure 5). A more detailed comparison between A. pubitessellatum and its allies, A. crassisepalum and A. taipingshanianum is given in Table 1 in aid of their identification. Species in sect. Heterotropa usually bear short-stalked, unicellular glandular trichomes on the inner surface of the perianth-tube (Sugawara 1987; Kelly 1997). However, it is normally not possible to preserve trichomes in herbarium specimens; therefore, this character has often been ignored by taxonomists. According to this study, we consider that the trichome type on the inner surface of perianth-tube can be a valuable character in the low-level classification of sect. Heterotropa. 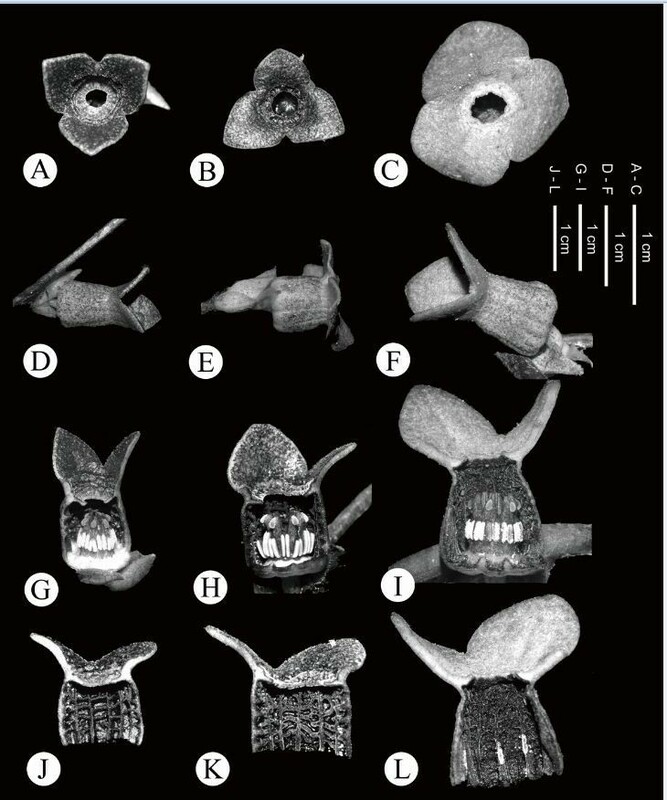 Comparison of floral morphologies of A. crassisepalum (A, D, G, J), A. taipingshanianum (B, E, H, K) and A. pubitessellatum (C, F, I, L). A-C. Front view; D-F. Perianth-tube; G-I. Dissected perianth-tube, showing anthers and pistils; J-L. Dissected perianth-tube, showing inner tessellated ridges. Trichome types on the inner surface of perianth-tube. A. A. crassisepalum; B. A. taipingshanianum; C. A. pubitessellatum. Checking the chromosome number of members of sect. Heterotropa, the species from Taiwan and Japan share the same basic chromosome number x = 12 (2n = 24, rare 36 or 48) rather than x = 13 (2n = 26 or 39, mainly distributed in southwestern China) (Huang et al. 1995; Kelly 1997; Lu and Wang 2009; Maekawa and Ono 1965; Ono 1960; Shi et al. 2008; Sugawara 19811985a1985b199219982003; Sugawara and Ogisu 1992; Yinger 1983; Yuasa and Maekawa 1976), suggesting that the Taiwanese taxa are more closely related to the Japanese species than the Chinese species. Pollen micromorphology is another valuable character in the low-level classification of the genus Asarum (Mi and Yang 1981; Huang et al. 1995; Lu and Wang 2009). Pollen exine ornamentation in sect. Heterotropa has been described as cerebelloid under verrucae for the Chinese species (Mi and Yang 1981), with rugulate-perforate, perforated subunits, incomplete reticulate or compact rugulate with large warts to small granules or none on supratectum for the Taiwanese species (Huang et al. 1995; Lu and Wang 2009; Lu et al. 2009; Lu et al. 2010) and microreticulate or microporate with gammae or verrucae or none for the North American species (as Hexastylis) (Niedenberger 2010). The perforate pollen tectum without gammae or verrucae on the supertectum in A. pubitessellatum is quite different from its related allies: incomplete reticulate with small supratectate granules in A. crassisepalum (Figure 2A,D) and compact rugulate with small supratectate granules in A. taipingshanianum (Figure 2B,E). This type of pollen is similar to that of A. hypogynum and A. chatienshanianum from Taiwan (Huang et al. 1995; Lu and Wang 2009) and A. naniflora from North America (Niedenberger 2010). However, due to a lack of palynological information from the most diversified area, Japan, we cannot validate the significance of pollen morphology in the infra-section classification of sect. Heterotropa. Geographically, A. pubitessellatum, A. crassisepalum, and A. taipingshanianum are currently distributed allopatrically, though they all occur in a similar habitat, under cypress forest [mainly composed of Chamaecyparis formosensis Matsum. or C. obtusa Sieb. & Zucc. var. formosana (Hayata) Rehder or both]. Their similar gross morphologies, pollen features, and habitat suggest that they are closely related. The contemporary geographic isolation of these three species may result from a decreased forest range or forest fragmentation. Further phylogeographical study is in progress to test this hypothesis. The two editions of Flora of Taiwan (1975–1979; 1994–2003) and the Supplement to the Flora of Taiwan, 2nd ed. 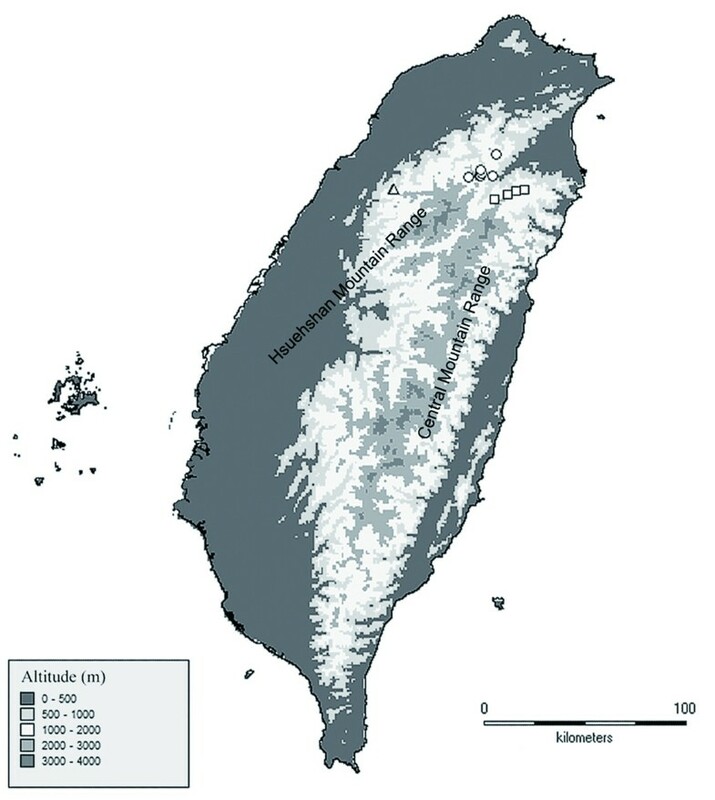 (Wang and Lu 2012) completely described Taiwan’s flora up to 2009. However, most recent findings, including new generic records, e.g., Ypsilandra (Hsu et al. 2011) and Phacellanthus (Chung et al. 2010), new species, e.g., Cotoneaster rosiflorus and C. chingshuiensis (Chang et al. 2011a, b), Pouzolzia taiwaniana (Peng et al. 2012), Thismia huangii (Chiang and Hsieh 2011), and Tripterospermum hualiense (Hsu and Chung 2012), and numerous newly recorded species, indicate that the documentation of the island’s vast and unique biodiversity is incomplete. This study echoes the suggestion of Hsu et al. (2011) and Peng et al. (2012) that the continuation of the botanical inventories is needed, especially those areas rarely botanized. The following key is provided to distinguish the species of sect. Heterotropa in Taiwan. Asarum pubitessellatum C.T. Lu & J.C. Wang, a new species is described and illustrated based on the morphological and palynological evidence. The present study showed the trichomes on the inner surface of the perianth-tube and pollen micromorphology were the valuable characters to distinguish the closely related Heterotropa species in Taiwan. We would like to extend our thanks to Dr. David E. Boufford and an anonymous reviewer for providing comments and advices on the manuscript. We would especially thank Ms. Pi-Fong Lu who told us about her discovery of this new species and aided in the field collection. This study was supported in part by Taiwan Forestry Research Institute, ROC. (No. 9521013500110502G345). CTL collected the materials, carried out the morphological and palynological observation. CTL, JCW, WLC drafted the manuscript. All authors read and approved the final manuscript.